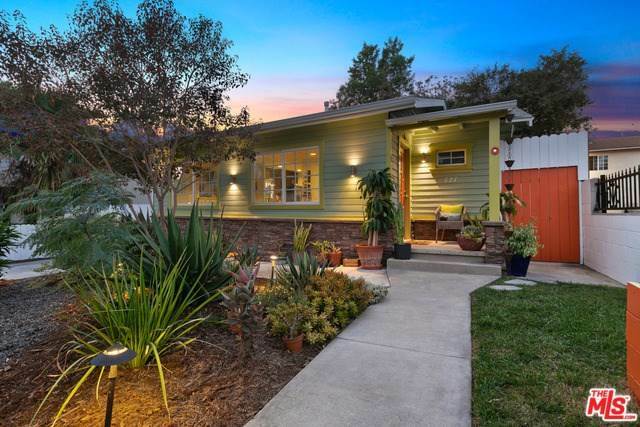 This charming Silver Lake bohemian bungalow is conveniently located in Virgil Village. Home to Jewel, Cafecito Organico, Sqirl, Bar Keeper, Corner Shop, Vinovore, Melody, Spice Station, & Roam Yoga on Hoover St. Through the gated driveway, you are greeted by a blooming Cara Cara Orange tree, topping off a professionally landscaped, gorgeous drought-tolerant succulent garden along with raised veggie bed. The house features an open floor plan but still retains some of its original built-in character, including the dining nook which opens to an updated kitchen. Both bedrooms have generously sized closets with en-suite baths & open to the adjoining back patio space. The home features a Rachio smart sprinkler system, a Nest smart thermostat, & updates to the plumbing, electrical, & sewer, all done in 2015. Off-street parking comes in the way of a detached garage/bonus space off the gated driveway. The home is a stone's throw nearby Sunset Junction, & is just off hip Hoover Street. SchoolsClick map icons below to view information for schools near 627 Imogen Avenue Los Angeles, CA 90026. Listing provided courtesy of Stephen Clark, Compass. Home for sale at 627 Imogen Avenue Los Angeles, CA 90026. Description: The home at 627 Imogen Avenue Los Angeles, CA 90026 with the MLS Number 18406216 is currently listed at $769,500 and has been on the Los Angeles market for 162 days. You are viewing the MLS property details of the home for sale at 627 Imogen Avenue Los Angeles, CA 90026, which includes 2 bedrooms, 2 bathrooms and has approximately 991 sq.ft. of living area.